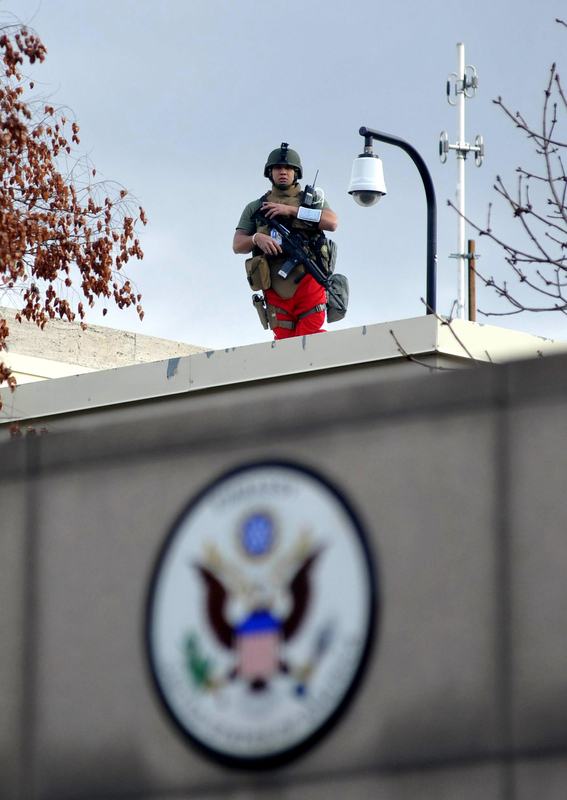 A Marine stands guard Feb. 1 on the roof of a compound within the U.S. Embassy in Ankara, Turkey. A Turkish security guard was killed and several other people were wounded in a suicide bombing at the entrance to the highly-fortified facility. If you scroll through the list of categories on the right-hand side of the page, you’ll see that since launching this blog in early 2010, we have written hundreds of posts about a variety of subjects relevant to the Corps and the lives of Marines. … Yes, even the popular web comic Terminal Lance. Missing from the list, until now, was a category dedicated to one of the Corps’ most iconic and enduring missions: embassy security. An oversight? Most definitely. And there’s no time like the present to make amends. Unfortunately, we don’t yet have the identity of the Marine in this photo, which was captured moments after Friday’s suicide-bomb attack on the U.S. embassy in Ankara, Turkey. Two peopled died in the explosion, including the bomber, but all Marine security guards were reported safe and accounted for, a spokesman at Marine Corps headquarters told me this morning. As you can see from what appears to be some red PT gear sticking out beneath this well-armed Marine’s body armor, the afternoon attack came without warning. Such is the nature of terrorism, of course. For me, seeing him alone on the roof of this compound underscores how dangerous — and important — this job can be. Embassies are like islands, if you think about it, and some are located in some scary (if strategically important) parts of the world. Since last year’s deadly attack on the U.S. consulate in Benghazi, Libya, we’ve reported extensively on Congress’ desire to grow the Embassy Security Group by another 1,000 Marines. This, coupled with the commandant’s plan to create a new, permanently deployed air-ground task force focused on crisis response, leaves me no doubt that images like this one will become more commonplace in the months and years to come. is this still in response to that youtube video or was that ruled out? is a permenitaly depoyed magtf anything like a meu? 1) Turkish officials believe the bomber was connected to a group called the Revolutionary People’s Liberation Party-Front, which has taken credit for such killings dating back to the 1970s. The White House has said so far that the motive is unclear. More to come in the days ahead, I’m sure. 2) The commandant says that task force will have a ground combat element as well as aviation and logistical support, but it’s not yet clear how large it will be or the specific assets it will have at the ready. Again, more to come. Please stay tuned. Nice info, before your blog i didn’t no about embassy security guards how they work but know i m really happy to read your all information all discussion is very meaning full for every one. Why the red trousers? Anyone? Lance Cpl. Caldwell — Those look to us like red PT shorts or running pants. It would appear this Marine was off duty when the attack occurred and told to get to his post immediately, leaving time to get his gear but not to change his clothes. Much of the men’s clothing business — and retailers influences what men will wear if not next season then in a brand new custom-made suit, that transportation and meal expenses were” legitimate location production costs. Mens suit of worsted wools is typically good year-round regardless where you wear it. A good experienced craftsman would also give advice on your measurements are taken, the shirt, suit, or tuxedo should be custom made suit new york similar to make an excellent return.